In the span of one week, our city has been blessed with a new grocery store with products from Myanmar, and now a brand new restaurant. 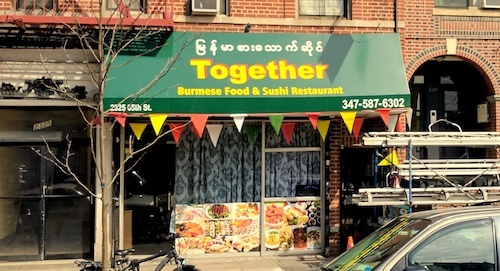 Near the Bay Parkway N station in Bensonhurst lives a new Burmese restaurant named Together. 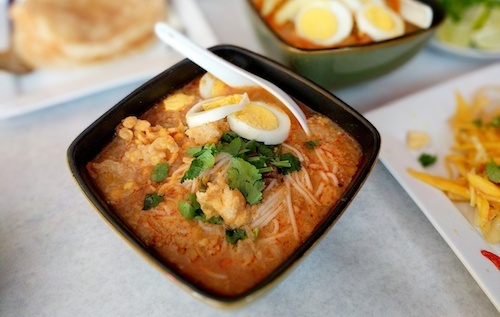 Chef owner Myint, known as Oscar, used to have a small stand inside of a grocery on Avenue U in Gravesend, where he made wonderful Burmese soups and curries. Thankfully he has resurfaced, hopefully for good. 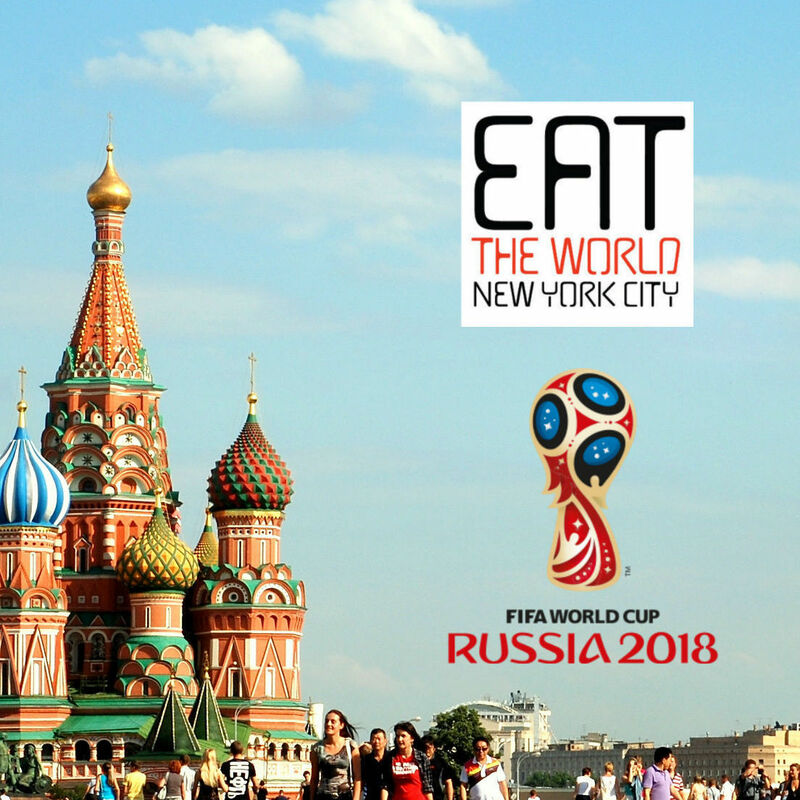 There are not too many Burmese people in the neighborhood, or the city in general, so Myint has decided to put sushi on the menu as well as basic westernized Japanese to cater to the potential customers that may find his home country's food too exotic. But for those of us that love Burmese food and everything Myanmar, first impressions are very good. On all three of my visits to the restaurant which opened Friday, I saw Burmese people that seemed to know Myint already. A smattering of locals seemed to wander in as well, mostly checking out the sushi rolls. Don't follow their lead, follow the Burmese, and order from the first page. Early in the morning in Myanmar, you will find steaming pots of soup ready for people going off to work. 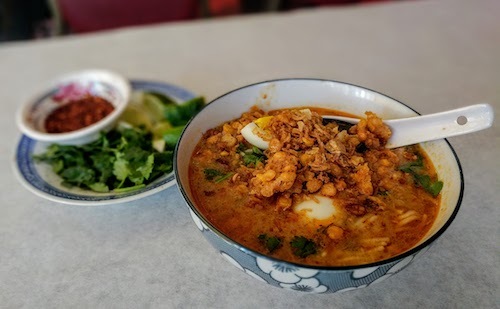 The most famous of these, mohinga ($5.99, above 2), is excellent here. 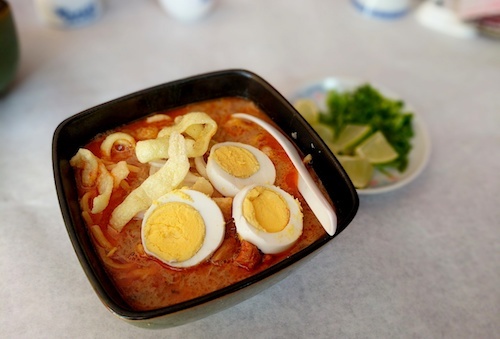 The broth of mohinga is made from catfish, but the dish never seems fishy. 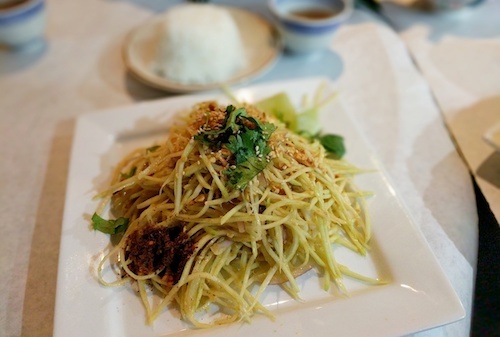 The rice noodles instead grab their flavors from lemongrass, ginger, onions, and garlic, as well as many spices. This version has a nice kick to it, and wants a good squirt of lime. Crispy fritters and parsley adorn the top. Also good is the ohnnotkhauswe ($5.99, below), a curried coconut milk soup with chicken and thick wheat noodles. This soup is more sweet from the coconut than spicy, its comfort level very high like Chiang Mai's khao soys or Malaysia's laksas. The restaurant is open at 9am daily, so enjoying these traditional breakfast soups is possible, but they are served all day if you come for lunch or dinner. On one of my visits, I was given a nice side of mudfish sauce with fresh vegetables (below). When morning turns to noon and the sun is high in Myanmar, people start eating salads of vegetables, fruits, and noodles. These dishes are served at room (or outdoor) temperatures, ingredients mixed together by vendors selling them on their front porches or roadside. 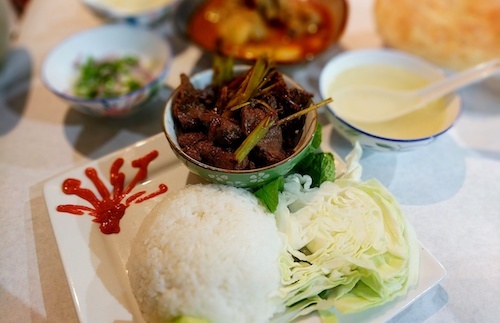 One of my favorites, especially in Shan State, was kha yann gyin thee thoke ($6.99, below). In this area of the country, many of the fruits and vegetables taste like magic, including the tomatoes. 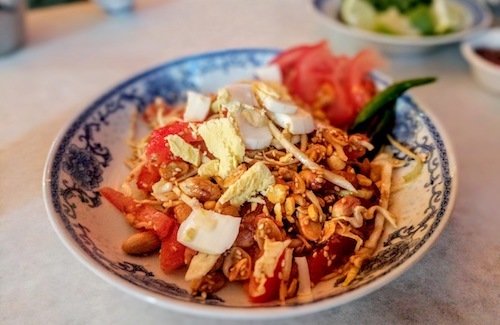 These magic tomatoes are the main ingredient in this salad which also includes peanuts, onions, garlic, lime juice, and fish sauce. In New York City our tomatoes are not magic, but this dish still exceeds expectations. 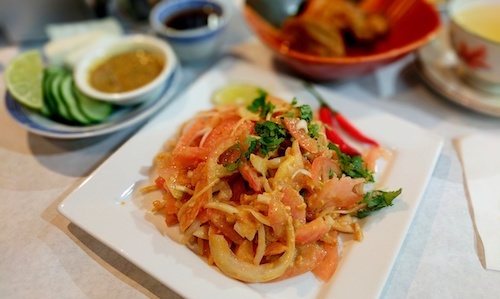 Similar preparation is made for the tha yet thee thoke ($6.99, below), a salad with sweet mango and crispy fried garlic. This is also served with white rice, which works well with the sweetness of the mango and peanut sauce. Recommended. 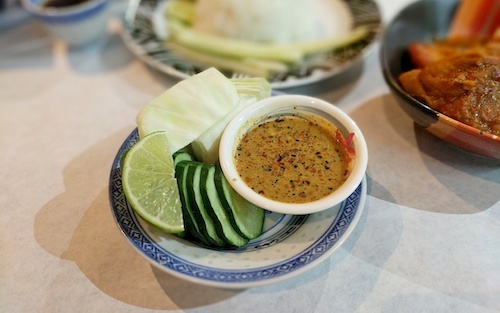 The thin baw thee thoke ($6.99, below) uses green papaya and less sweet peanut sauce. Mixing in a good portion of the dried chili flakes makes for a good flavor combination. 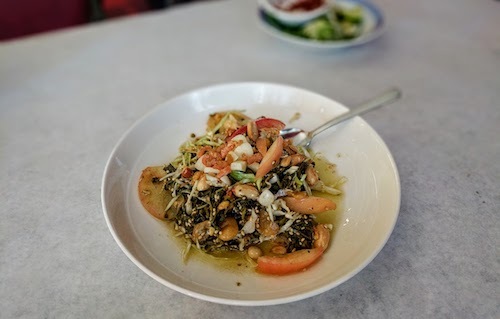 Off menu, the dynamic ginger salad is also not to be missed! 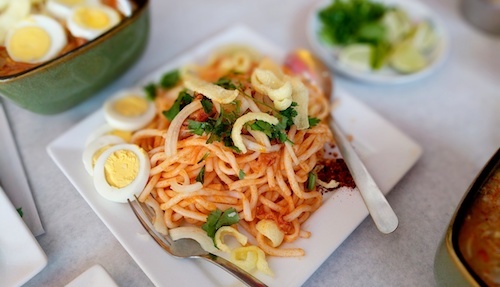 In addition to these, there are many "salads" made from noodles in Myanmar. Often on the street a vendor can make the dish as a salad or a soup by adding broth, but it was almost without exception that the salads were better and more flavorful. 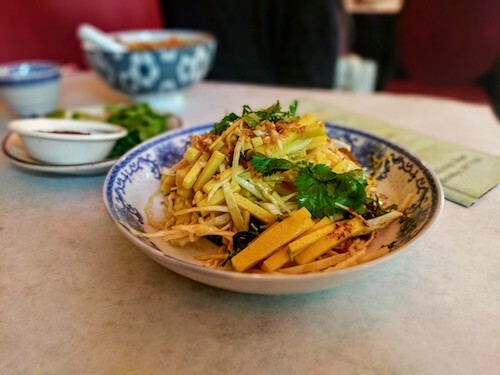 One of these is the Mandalay nan gyi thoke ($5.99, below), a dish of thick rice noodles and chicken curry. 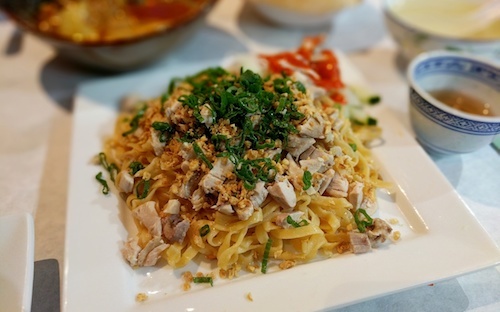 While that was indeed delicious, even better is the si jet ($5.99, below), egg noodles with chicken and dried garlic. On all three visits, Burmese people seemed to be ordering this more than anything else. Sitting down in formal restaurants in Myanmar is still casual, but the dining experience is quite different. 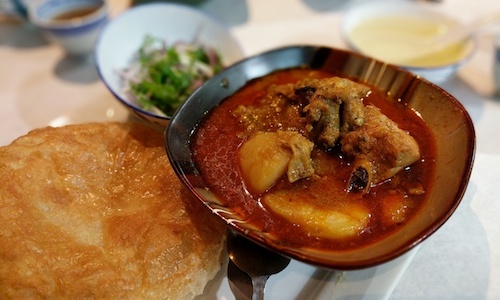 An order of curry will bring many dishes to the table, the small dish of curry itself and many fresh vegetables, herbs, and other tasty things to add, making each bite a different taste. 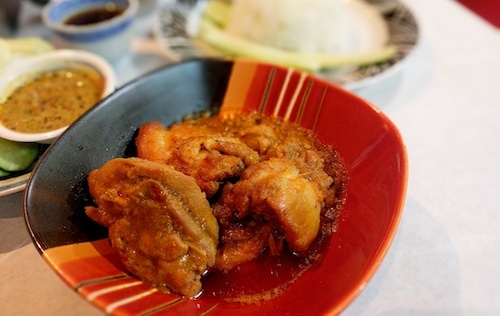 There will be small dried salty fish, a plate of rice, and a little bowl of simple chicken broth to cleanse the palate. 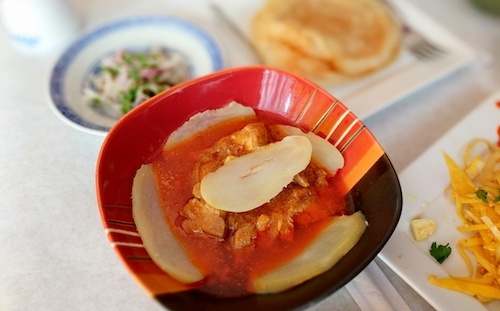 Curries are also served at room temperature, something I constantly saw foreigners getting weird about. They also have plenty of greasiness in the bowl, which mixes perfectly with bites of rice but may not align with some tastes. After a full meal, Together does not disappoint with dessert either. 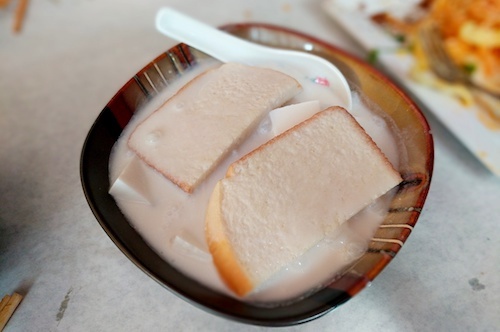 Try the shwe yin aye ($3.99, below), a bowl full of coconut jelly, tapioca, and sticky rice in cold coconut milk. The slices of white bread on top were discarded by our group, who found the real interest in the other bits underneath. OK, New York City. Our man Myint is here. Go give his restaurant a call and make sure it lasts. 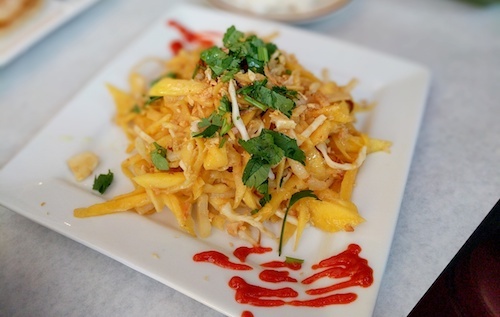 Burmese food should really have a place here in our city, and the renditions here are worthy of a lot of praise.